Looking to add a bit of green to your space? Zilpakala is the way to go if you want to take the quirky route. The Bangalore-based decor brand is in the business of making cutesy and whimsical planters. Starting out five years ago with just a collection of handcrafted terracotta vases, Zilpakala has now evolved into a full fledged garden decor brand. With planters, terrariums and garden accessories, all under its umbrella of products, these are your go-to guys when it comes to indoor plants and gardens. 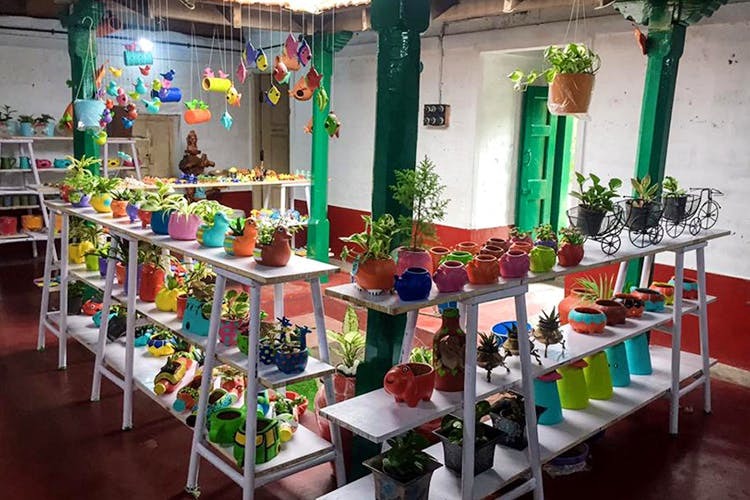 From adorable little piggie pots to tiny flowers or honey bees you can hang from the top or poke into your planters, this space is doing indoor plants with a big dose of cute. We also spotted teacup and kettle planters to wall-mounted ones here that are fun and whimsy. The planters come with plants too — from lucky bamboo to money plants. Focusing on indoor gardening, Zilpakala sticks to creating eco-friendly products only using mediums like terracotta, glass and metal. Apart from sprucing up your own home, these products make great gifts too. Skip the usual bouquet of flowers and opt for a terrarium instead, which is sure to last a lot longer. Terrariums start at as low as INR 250. In fact, the prices are quite economical here, starting at INR 100 and going up to INR 4,500 for the more intricate pieces. Zilpakala has two stores in the city you can hit up to check their stuff out — one in Yelahanka and the other is close to the Swami Vivekananda Metro Station. These guys also set up shop at flea markets and exhibitions as frequently as once a week, so you can catch them at these too. Follow their Facebook page here to find out where they’ll be at next.